MACOMB, IL - The Western Illinois University School of Music will present the 46th annual Western Illinois University Jazz Festival Friday and Saturday, Feb. 15 and 16, in the College of Fine Arts and Communication (COFAC) Recital Hall. Friday's main event will be a 7:30 p.m. performance in the COFAC Recital Hall by the WIU Jazz Band and Jazz Studio Orchestra, featuring guest Andy Martin, trombone virtuoso. Saturday's 3 p.m. concert will feature performances by college, high school and junior high students. Coming from a musical family, Martin launched his career while still in his teens. His technique and virtuosity quickly established him on the Los Angeles music scene. As an instructor, Martin has influenced countless young players. He has appeared at many colleges and universities throughout the country as a guest artist and clinician. A world-class jazz musician, Martin is featured as leader or co-leader on 12 albums. These albums showcase his collaboration with other top jazz artists such as the late Carl Fontana, Pete Christlieb, Bobby Shew and Eric Marienthal. He has also collaborated as a sideman with jazz greats such as Stanley Turrentine and Horace Silver. Martin had a long association with British bandleader and jazz promoter Vic Lewis, and was the featured soloist on many of Lewis's CDs. 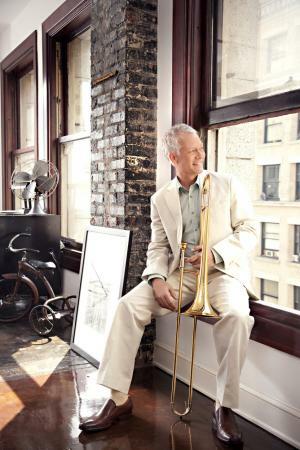 Martin is well known for his work as a lead player and featured soloist with virtually every big band in Los Angeles. Martin is the lead trombonist and featured soloist with Gordon Goodwin's Big Phat Band, the lead trombonist and soloist for The Tom Kubis Band, and was a featured soloist for the Bill Holman Big Band for 15 years. He has appeared in bands led by Jack Sheldon, Louis Bellson, Quincy Jones, Matt Cattingub, Bob Curnow, Patrick Williams and Sammy Nestico, among others. Admission prices are: Public $15; Senior Citizen $10; Youth $7; WIU students free with valid University ID. Tickets available at the Hainline Box Office and at the event. Live streamed events can be viewed on the Western Illinois University YouTube Channel. For the general public who wish to attend, Friday night concert tickets are available at: Hainline Theatre Box Office, Browne Hall 114, Western Illinois University, 1 University Circle, Macomb IL 61455; (309) 298-2900. Box office hours are Monday-Friday, noon-5 p.m.